In The Free World, a previously violent ex-convict named Mo (Boyd Holbrook) works at an animal shelter, caring for dogs deemed dangerous as well as the ones beaten by violent owners. When one of these badly beaten dogs is brought in by a man who clearly also takes his aggression out on his wife, Doris (Elisabeth Moss), Mo becomes unintentionally involved in the conflict. Doris and Mo built an unusual relationship which inevitably turns romantic, though Lew is less concerned with this than pounding the audience over the head with the animal rescue theme, going so far as to hide Doris in a dog carrier in one scene. This metaphor may not have seemed quite so heavy-handed if it hadn’t recently been used in a much better film. The Drop starred Tom Hardy as a previously violent man who discovers a badly beaten dog which leads him to a relationship with a woman whose ex used to beat her, and who is also responsible for the beating of the dog. The Drop was based on a short story called “Animal Rescue,” just in case the comparison is not clear. It also doesn’t help that Holbrook has similar features as Hardy, making it impossible not to compare the performances. This is a shame, because Holbrook gives a breakout performance which is overshadowed by an actor from another film. The fault of the film’s shortcomings lands unequivocally on the screenwriting, which is heavy-handed at times and woefully understated at other moments. There were key plot developments lost within the half-written dialogue, important information never given proper emphasis. It quickly becomes a movie that is only held together by the performances, and they are just good enough to nearly compensate for some of the more amateurish elements of filmmaking. It makes sense that Lew has most of his film experience in front of the camera, as the acting is all that saves this movie from being a confusing and derivative mess. Moss and Holbrook give spectacular performances as two wounded animals in need of rescue, but also ones capable of biting back if trapped in a corner. As ham-fisted as the theme is, and as similar as it may be to another film with the exact same symbolism, Holbrook and Moss elevate Lew’s film far beyond what the material deserves. But that doesn’t mean that all casting decisions have the same impact. 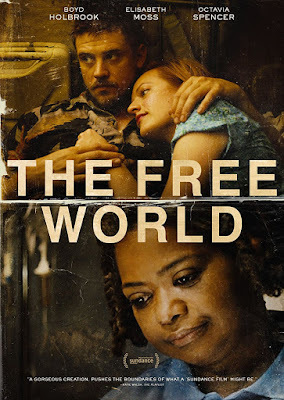 While Octavia Spencer has one or two decent scenes as the manager of the animal shelter, her presence is almost too distracting when it becomes apparent that the role is little more than a glorified cameo. Casting a familiar face and name is only helpful if they are properly utilized, but Spencer’s inclusion mostly just left me wondering why her talent was wasted. She unceremoniously disappears from the narrative after the first fifteen minutes, but it takes the film devolving into an outlaw road trip to realize that her character was never significant to begin with.